OK, so I’m really behind on my posts. I’ve got a few posts hanging out in the draft section of my dashboard, just waiting for me to put the finishing touches on them. But, I had to put this post ahead of the rest, because … IT’S TEA TIME! I don’t know if the great minds at Knoshy actually read my blog. I hope they do. But, I’ve been mentioning in several box announcement posts about my desire for a tea time box. They’ve finally given me my heart’s desire! The theme for this month’s box is Tea Time! So, the first thing that needs to be in a Tea Time box is tea, right? And what better company to select a tea from for this box than Steven Smith Teamaker? There’s a full box of Lord Bergamot (one of my very favorite Earl Grey teas – in the top three – of all time!) and even though they’re sachets – tea tastes better when it’s loose leaf! – I won’t ding ’em for going with the sachets. I understand … I get it … not a lot of people know what to do with loose leaf tea. They also included a package of Amsterdam Wafel cookies from Rip Van Wafels. I’ve had these before, and they’re totally yum. I’m glad they’re in this box. There is also a package of my favorite shortbread cookie baker – Lark Fine Foods! These are Sweet and Savory Olive cookies. Interesting. Finally, there’s a jar of You’re My Boy BLUE-berry Bourbon Jam from the Jam Stand. This sounds like a seriously yummy jam … it would be spectacular on scones. I might have to make some scones soon to try it out. I’m thrilled with this month’s box! Thank you, Knoshy! Photo from Knoshy. Click on the pic to go there. Get ready to enjoy some of the best granola on the planet. Made with all natural, organic and gluten-free ingredients, including: quinoa, an ancient grain considered a complete protein; amaranth, high in b vitamins; chia seeds- providing excellent sources of omega-3 fatty acids, fiber and antioxidants; and raw virgin coconut oil containing medium-chain fatty acids that get used as energy rather than stored as fat. I received a pouch of this granola in my January Box from Knoshy. Because I ate this granola as a breakfast cereal with milk, I decided that a breakfast tea was the way to go! Recently, I discovered Glen Arbor Breakfast Tea from Whispering Pines Tea Company, and it’s a great breakfast tea. Very woodsy and rustic, a perfect complement to a granola cereal! This just may be the best granola I’ve ever tasted. I was surprised with the first taste, because while it LOOKS like just about every other granola out there, the flavor is much better. The cinnamon is well-defined. The oats have been baked to a nice crispy texture. A tasty nutty flavor from the pecans, and just enough plump, juicy flavor from the cranberry to give it contrast. My one complaint: I would like a little more cranberry in this. That’s something that’s easily remedied by adding a handful of Craisins to the bowl, and even though I’d argue that the right amount of cranberries should be in the granola already, the flavor of the granola makes it worth it to me to open my package of dried cranberries and add a few to the bowl. I really liked this. It was a delicious granola, and I’m going to be picking up more from Chuck’s Produce, as I’ve noticed this on the shelves the last time I was there. I’m definitely going to be wanting more! 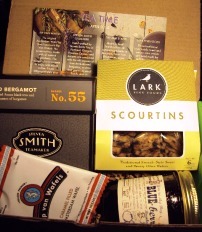 Photo from Graze. Click on the pic to go there. I received this in my March box from Graze. No tea suggestion with these nuts, mostly because I didn’t enjoy this particular snack enough to try to find a way to incorporate it into tea time. I’ll be honest and tell you that I went into this particular tasting certain I wouldn’t like it. Oh sure, I like cashews, brazil nuts and pistachios. Love ’em! But, these are unsalted cashews, brazil nuts and pistachios, and I’m of the opinion that the nuts should be at least lightly salted. I’m still of that opinion. I think that these would definitely be tastier if they were lightly salted during the roasting process. This might be the first time that I’m trying these three particular nuts unsalted, and I do appreciate the opportunity to try them without the salt. However, I don’t think I like them enough to want this snack again. I “trashed” this snack on graze. I just simply didn’t enjoy the unsalted nuts enough to want to finish the tray of nuts, and I certainly don’t want to receive them again. I don’t HATE them … but, I didn’t really find the snack enjoyable either. They’re just kind of … meh … you know? Photo from Beanitos. Click on the pic to go there. Whole Navy Beans, Whole Grain Long Brown Rice and/or Long Grain White Rice, Pure Sunflower and/or Safflower Oil, Guar Bean Gum, Sea Salt. I received a bag of these chips in my February Love with Food Box. As with most salty snacks like this, I went with a glass of refreshing iced tea, and the tea that I had chilling in my fridge when I opened this bag of chips was this Very Big Hill Dew Iced Tea from Southern Boy Teas. I liked the sweet-tart contrast that the drink brought to this salty, savory snack. Having previously tasted another Beanitos product, I was fairly sure I’d enjoy these too. And I did enjoy them. What I like best about them is the texture of the chip – crisp, but not dense like a typical corn chip. I also appreciate that they’re not too salty. I can taste the bean. I can taste what seems like a hint of lime to these too … and I found myself wanting a little more of that acidic flavor. I think that maybe just a little bit more lime would really brighten up the flavor a bit. A tasty snack. As I said above, I found myself wanting a little bit more of that lime note. It would be really tasty with a guacamole with an extra squeeze of lime, I think. Photo from Tcho. Click on the pic to go there. TCHO PureNotes™ exquisite dark chocolates are the purest expression of the cacao bean itself. As with wine, what you taste is precisely, and only, what’s in the bean. There are no added flavorings, only pure dark chocolate. Warm, roasted nuttiness and complex dried fruit notes from freshly roasted Blue Bottle coffee blend seamlessly with the dense caramel and cocoa notes in our SeriousMilk chocolate. Named Best Flavored Milk Chocolate in America by the International Chocolate Awards. Both these bars were in my February Love with Food box. In my February Love With Food box, I received two squares of chocolate. The first is a dark chocolate square: Pure Notes Dark Chocolatey 70%. This is an intense dark chocolate. A nice snap. I allowed the chocolate to melt on my tongue a little and I could taste notes of rich, dark fudge, reminiscent of a rich, creamy fudge that you might have drizzled over your ice cream in the really good ice cream parlors. I could also taste roasted notes, like a roasted nutty flavor. This dark chocolate square reminded me a little bit of a really, really good Fujian black tea – rich, malty and even a little caramel-y. So much complexity within the layers of this chocolate. The second square is a milk chocolate with coffee square: Mokaccino Serious Milk + Blue Bottle Coffee. Now, normally, I frown at coffee flavored things, but, this chocolate bar is quite yummy. I could happily devour one or more of these chocolate squares daily. The coffee notes bring out something extra in the chocolate, and it becomes a very full, rich, decadent flavor for the palate. Sweet, creamy, and indulgent … and reminds me of those mocha drinks I used to love but can no longer drink because I realized that coffee consumption causes me to feel sick a few hours later. Fortunately, I didn’t feel that way after I ate this chocolate square … the only thing I felt a little later is a desire that I had more chocolate! These chocolate bars from Tcho were amazing. Then again, when is chocolate not amazing? But these were really, really good. The next time you’re looking for really, really good chocolate, you won’t go wrong with Tcho. Besides being delicious, blueberries specialize in true-blue anti-oxidant power and are particularly bewitching covered in chocolate. 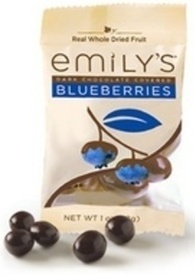 I received a pouch of these chocolate covered blueberries in my February Love with Food box. I decided to go with a fresh tasting green tea to drink while I devoured these yummy blueberries, so I chose this Organic Gunpowder Green Tea from Simple Loose Leaf. The tea has a light, brothy texture and a delicious nutty background of flavor, and I liked the way this contrasted with the sweet-tart flavor of the blueberries and the bittersweet dark chocolate. I was recently told that I “like everything!” by someone visiting my blog and reading a few of my reviews. And I guess, yeah, I’m guilty of that. Most of the foods that I’ve reviewed here, I’ve enjoyed. Occasionally, I’ll try something I don’t like, and I’ll tell it like it is when I come across those foods. I sometimes wish that I had a more “discerning” palate, but, when I think about it, there’s nothing wrong with finding something that I like in most foods. It means that I get to enjoy more variety in my diet. Variety is the spice of life, baby! And I do like these blueberries from Emily’s chocolates. First of all, I love that this is a local company. (Well, kind of local. We’re in the same state, anyway!) The dried blueberries are big and plump, and the dark chocolate shell is soft and decadent. I devoured the bag in no time, and I found myself wishing that I had more. Because this IS a local company, I know that I’ll be able to find these products in some local shops, so next time I see them on the shelf, I’m going to be putting some in my cart! Yum!